FALMOUTH, MA – The diversity of Cape Cod lifestyle offers active family’s an opportunity to balance travel, adventure and fitness. Water enthusiasts on a kayak tour of Great Sippewissett Marsh in West Falmouth regularly enjoy views of nesting Osprey, Great Blue Heron, Green Heron, White Egret, Loons and Canadian Geese. “Our goal is to help create lifelong memories,” says Kimberly Fernandes. Ms. Fernandes is owner of Cape Cod Kayak of Pocassett, MA and has been leading daily tours on Cape Cod waterways for nearly twenty years. Cape Cod Kayak offers daily guided tours of local waters, with instructional classes for beginners throughout the year. Naturalists on-staff are happy to discuss how continued conservation efforts on the Upper Cape have changed their office on the water for the better. “New nesting platforms for Osprey has allowed their population to really take off,” Ms. Fernandes said. The months of August and September are the peak of shorebird migration in Falmouth, when the greatest abundance of birds hatched this year are added to the population before the losses of migration and winter. Corporate outings, full moon tours and fall foliage tours have also become increasingly popular. Stand-up Paddle Boarding, Self and Assisted Rescue Kayaking, and a popular Kids Kamp, where children learn basic safety and paddling skills in Megansett and Monks Cove, are available. Instructional classes and guided tours are offered on Mares Pond, Quaker Marsh, Coonamessett Pond and West Falmouth Harbor. During winter months, instructional classes are offered in the pool, sometimes at Wareham YMCA and other times at Sandwich High School. Last year an Eskimo Roll Class and Self and Assisted Rescue Class were offered. The staff of her new retail shop will outfit newcomers or supply veteran water sports enthusiasts regardless of experience level. Ms. Fernandes is especially proud of building lifelong relationships with regular clients, saying it’s common for the same family to return for reunion trips year after year. “I remember many of the kids from when they were little and could hardly hold a paddle and before you know it they’re in solo kayaks doing barrel rolls,” she said. Visitors are asked to provide bottled water, a hat, sunscreen and board shorts and Cape Cod Kayak will take care of the rest. Sea Kayak’s and Recreational Kayak’s are available. Visitors are equipped with a kayak, life jacket, paddle and spray skirt. Rental costs range from $49 to $79 for two to three hour tours, with half day trips and day and week rentals also available. An end of season sale on used boats and equipment is scheduled from Labor Day to Columbus Day. Cape Cod’s out wash plains have mellow flat trails, but riders can crank up the intensity level as they move up onto the moraines. These trails provide swooping single tracks and quick descents and climbs into a seemingly endless array of kettle holes. Other popular active pursuits, such as mountain biking and road cycling are also a part of everyday Village life. A one-stop resource for cyclists is www.cyclingcapecod.com – an extensive list of links to many of the things that can be done on a bicycle on Cape Cod. The website was built and maintained by Falmouth resident Ted Rowan, a part-time employee of Corner Cycle of Falmouth. “The obvious starter trails for beginner to intermediate riders are the various bikeways found throughout the area,” Mr. Rowan said. In Falmouth, the Shining Sea Bikeway was judged the second most used bikeway in the commonwealth by Mass DOT, with the Minuteman Bikeway being the busiest. The beautifully maintained path runs 10.7 miles along the coast from Falmouth to Woods Hole, through salt marsh, cranberry bogs, ponds and woodlands. Cape Cod Life Magazine voted the Shining Sea Bikeway in Falmouth as the best walking and biking path on Cape Cod for 2013. On a mid-summers day near the 4th of July, nearly 200 people per hour passed the counting point heading to Woods Hole and at Woods Hole, the numbers were slightly higher leaving Woods Hole. “These numbers are typical for the hours of 10 AM until 2 PM on most summer days since the bike path was extended and are double from counts done in 2004, before the extension,” he said. Group rides along the bikeway are sponsored by the Appalachian Mountain Club’s Southeastern Massachusetts Chapter. These are mellow rides led by Cape residents that know a particular town very well. The Cape Cod Cycling Club also offers rides for all levels of fitness. Many group rides depart from the trail head parking lot at Route 151 in North Falmouth Village, The Falmouth Library or the Depot Avenue Bus Station, where public parking and restrooms are available. If you’re looking for something a little more intense, the forests surrounding Otis Air National Guard Base are a destination for mountain bike enthusiasts of all levels. 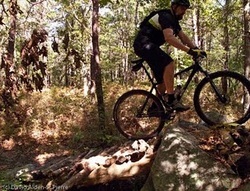 Off road riders will find hundreds of miles of single-track through the woods from the Cape Cod Canal to Provincetown. “These trails provide dependable riding year round for riders with intermediate or better abilities,” Mr. Rowan said. Falmouth is a great place to find an wide range of mountain biking trails. In central Falmouth, riders share the trails of Beebe Woods, along a mixture of old carriage trails and a fair number of single tracks that criss cross the beautiful forested area. There is also a fun loop through the Falmouth Town Forest, where a 4 mile fire road encircles Long Pond. While Cape Cod’s out wash plains have mellow flat trails, riders can crank up the intensity level as they move up onto the moraines. These trails provide swooping single tracks and quick descents and climbs into a seemingly endless array of kettle holes. Mr. Rowan describes the “gravity cavities,” as a challenge for even the most experienced riders. “They can really get your heart rate up,” he said. Crane Wildlife Reservation and the forests on both sides of Route 151 have a number of trails from challenging single track to double tracks, where families can experience a fun evening ride with the deer and other creatures moving about at twilight.